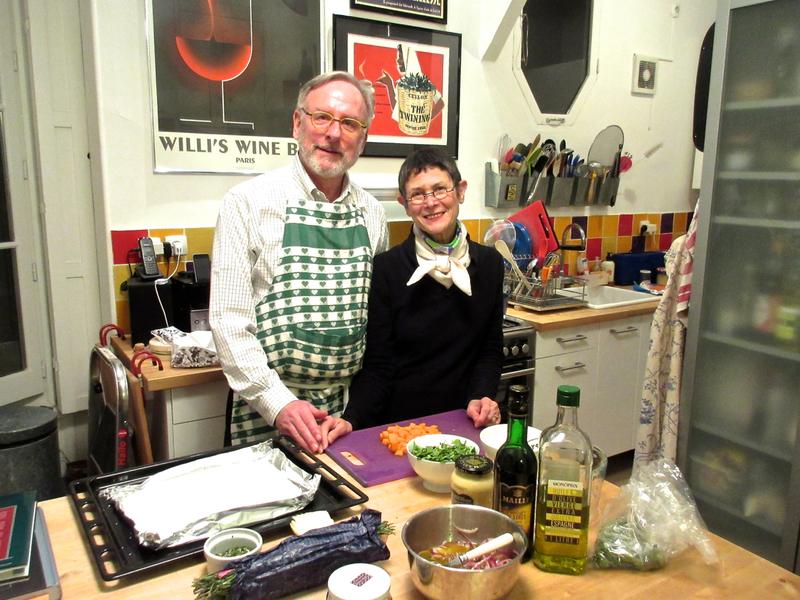 I had a thrill recently while in Paris: cooking a meal with Dorie Greenspan. 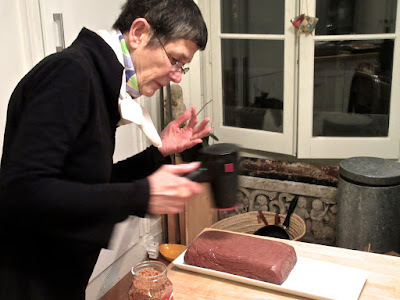 Readers of this blog will know of my admiration for Dorie and her cookbooks, specifically her Around My French Table and Baking Chez Moi. For nearly a year, Dorie and I have been email pen pals, thanks to an introduction from her son via a neighbor. And even though her New York apartment is not far from mine, we somehow have never seen each other there. Finally, though, it turned out that we would both be at our Paris apartments over the holiday, and we decided to prepare a meal to eat en famille with Joan and Dorie's husband and her son and his girlfriend. We had a lovely meal and Joan and I thoroughly enjoyed getting to know the whole family. It is not surprising that Dorie and I do not operate in the same way. I cook from recipes; she does not, although she spends much of her life creating them, but rather relies on her culinary experience and instincts. And can she improvise! We shopped early on the day of our dinner at teh wonderful Richard Lenoir market near the Bastille, and while at the volaillerie, she spied some gorgeous chicken livers, from which she concocted a truly spectacular chopped liver. Not your mom's, this one had no egg, no chicken fat, no bread crumbs, just chicken livers coarsely chopped with a heavenly blend of spices made up on the spur of the moment, including a bit of hot, garlicky sriracha and, I think, a pinch of Chinese five-spice powder. I am trying to get this recipe but may have to wait until it is published (as it should be!). 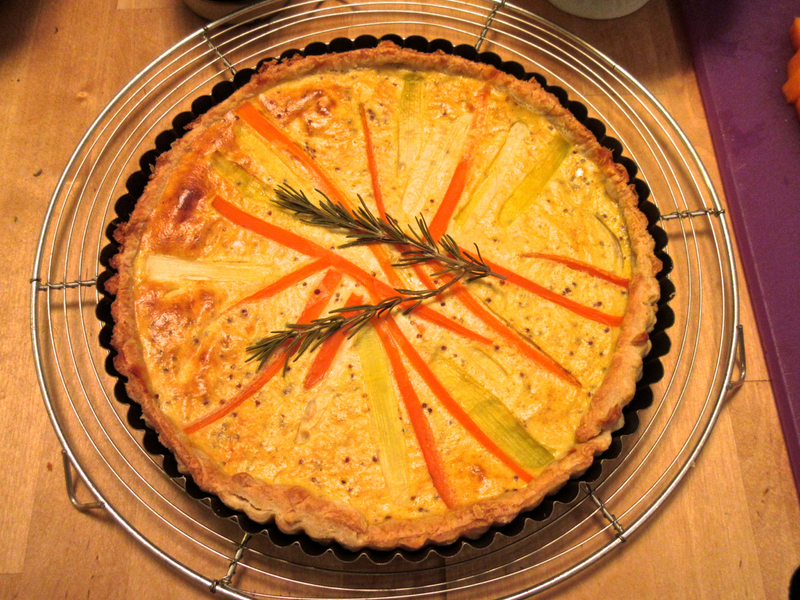 The other hors d'oeuvre was a delicious rendition of "gerard's mustard tart," from Around My French Table. 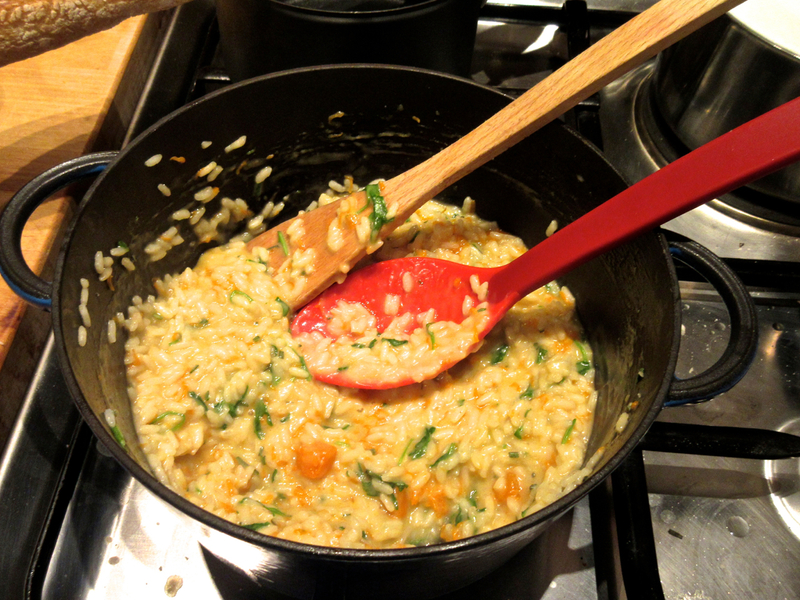 Then came a delicious pumpkin risotto, which we prepared from Michael Romano's recipe in The Union Square Cookbook using great French potiron . . .
. . . followed by herb-crusted salt baked salmon from Food52 Genius Recipes, atop a potato and celery root purée that Dorie happened to have around. 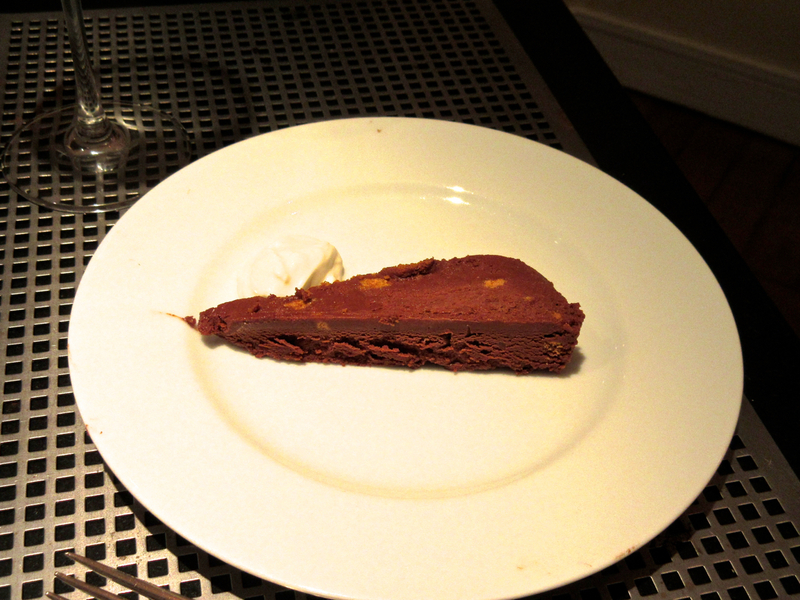 Finally (well, after a wonderful cheese course), Dorie's rich marquise au chocolat, as detailed in Baking Chez Moi, just unfrozen enough to cut and sprinkled with crushed speculoos cookies. In addition to the obvious pleasure of the cooking, highlights of the day were getting to know Dorie and her family, and hearing anecdotes about the cooking greats (past and present) whom she knows well and has cooked with and for. 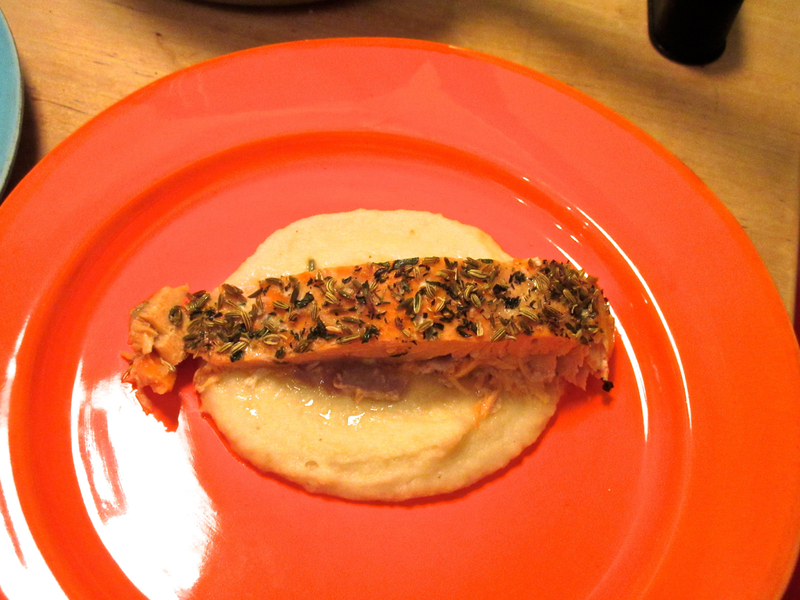 (In addition to household name restaurant chefs, she is a friend of my idol, Jacques Pépin.) It's a joy to hear first-hand stories and cooking lore from this petite dynamo, who has spent a varied and successful life in food.